A magnetic resonance imaging (MRI) scan is a common procedure used by hospitals around the world. An MRI Scan utilizes a strong magnetic field and radio waves to create detailed images of the lower back (spine lumbar) region. MRI scan is a non-invasive and painless procedure. Unlike X-rays and CT scans, MRI scan does not use radiation and hence is a safer procedure. A contrast agent is injected in the body or given orally for MRI Scan Spine Lumbar with contrast. This generally gives better images than MRI without contrast. However, your doctor will be in a best position to decide which one to go for. Most MRI Scan Spine Lumbar machines require the patient to lie down and go into a machine. For people who fear closed spaces, this may cause anxiety. The technician can give sedatives in those cases. Another alternative is to opt for an open MRI which is more expensive but will not cause anxiety. Tesla is a unit of measurement of magnetic strength. MRI machines can either be 1.5 tesla or 3 tesla. A 3 Tesla MRI Scan machine can produce better quality images at a faster pace. However, they are more expensive. Additionally, for most of the MRI scans that are done in India, the 1.5 Tesla machines are adequate. Depending on the details required for Spine Lumbar region, the doctor may recommend a screening or a normal MRI. The default is normal. Screening MRI scan is less expensive and details are slightly less. The MRI machine looks like a tube that has both ends open. You lie down on a movable table that slides into the opening of the tube. A technologist monitors you continuously. Some tattoos or tattooed eyeliner. During the MRI scan, the internal part of the magnet produces repetitive tapping, thumping and other noises. If you are worried about feeling claustrophobic inside the MRI machine, talk to your doctor beforehand. You may receive a sedative before the scan. 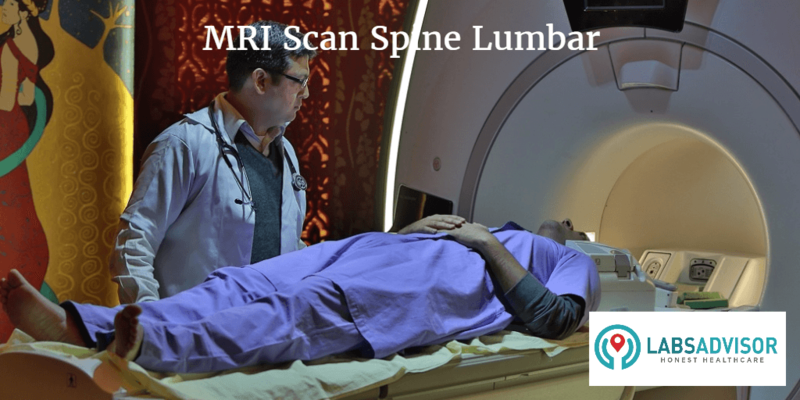 MRI scan can Spine Lumbar also be done in an open MRI machine which is generally more expensive. In some cases, a contrast material (MRI Spine Lumbar with contrast), may be injected through an intravenous (IV) line into a vein in your hand or arm. The contrast material enhances the appearance of certain details. The material used for MRIs is less likely to cause an allergic reaction than the material used for CT scans. An MRI can last up to 45 minutes or more. You must hold very still because movement can blur the resulting images. Why is MRI Scan Spine Lumbar Done? MRI does not use ionizing radiation (high-energy radiation that can potentially cause damage to DNA, like the x-rays used CT scans). There are no known harmful side-effects associated with temporary exposure to the strong magnetic field used by MRI scanners.